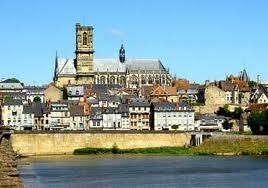 We left Camping Saint Lambert around 10am and set off for Nevers, to try our first Cool Camping France site in the centre of town on the banks of the river Loire. We arrived around 5pm and there were plenty of places for tent camping on the lower level but the upper level caravan/motorhome camping seemed to be nearly full. We found a pitch (you basically pitch where you like) on the lower level and set up camp. I can see why the guys at Cool Camping recommend this site as it is very easy going and laid back, it’s on the banks of the Loire and the impressive Nevers cathedral is on the opposite bank of the river. This site was the cheapest yet – 27 euro with EHU. The caravan/motorhome camping on the upper level seemed a bit more formal and this is where the clean toilets and showers are situated – a bit of a trek in the middle of the night but not too bad. After a gnocchi dinner we took a walk across the bridge and into town in search of tobacco for Bruce. Other than the bars and restaurants, particularly around the cathedral square, the town was closed and seemed deserted with some shops boarded up. This seemed strange coming from the forever open south but, although Nevers is a pretty town it seems off the tourist trail, except for night halts to and from the south. Needless to say we didn’t find a Tabac open and we returned to camp empty handed. The next morning we returned to town on a Tabac and croissant hunt. We found a small patisserie slightly to the left when you cross the bridge and I had my first pain au raisin of the holiday ( a favourite of mine but nowhere to be found, except supermarket ones, on the Med). All the shops were closed and when we stopped for a coffee at a small bar we found out why – the shops are closed every Wednesday!! We decided to search no more, the clouds were coming over and it was time to move on – our intention being to stop just north of Paris for our last night.